This week’s content is quite different from the movements and styles that were addressed in the previous weeks. This week you will be working three-dimensionally and engaging space. Creating a site-specific environmental installation is a very unique experience (especially if you have never attempted it before). Your goal will be to find a meaningful outdoor site and produce an installation specifically for that area. Considering the site and its relationship to your installation will be one of your most important objectives. 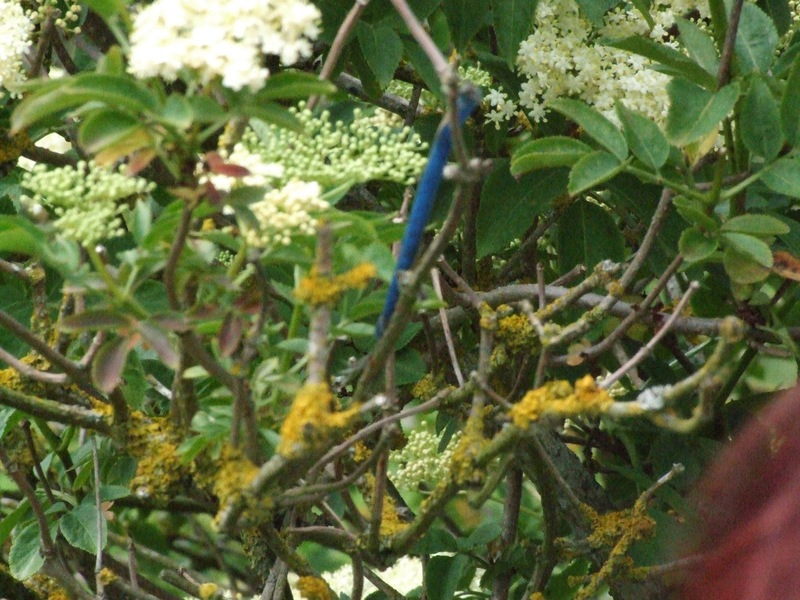 It has been a wonderful challenge - and a completely different way of enjoying a walk in the countryside... Though it could have been just as exciting to create an installation in an urban landscape. This week's lesson for practice would definitely be to get students out of the classroom - and into the spaces outside. I would set them the task of creating mini-installations - and reflecting on them the way we have been asked to reflect on ours. Here are some pictures of my installation - and my answers to those contextualising, reflective, creative questions. 1. Explain your process (medium and technique). How was it made? Which art materials and approaches did you use and why? This assignment was all about the process for me – the process of truly inhabiting the landscape near where I now live – and playing with it – photographing it – making small installations here and there – and of eventually choosing the installation that I liked the best. I spent three hours slowly walking around the area – up hills, down tree-shaded paths, near large fields, beside trickling springs… I wound wool-like rope into trees, I placed my shoes in puddles, I placed shoes walking in to and out of various forms of greenery… I floated my shoes in water, I created caches of stones and leaves in bole holes in trees, I shaped wheat from broken wheat stems, I photographed a knotty root as if it were itself a tree – and added a twig with leaves… but in the end the installation that I loved the most was installing a strip of blue-plastic-covered wiring into the most beautiful bush/tree – where it complemented the green of the leaves, the white of the flowers and the yellow of the lichen. 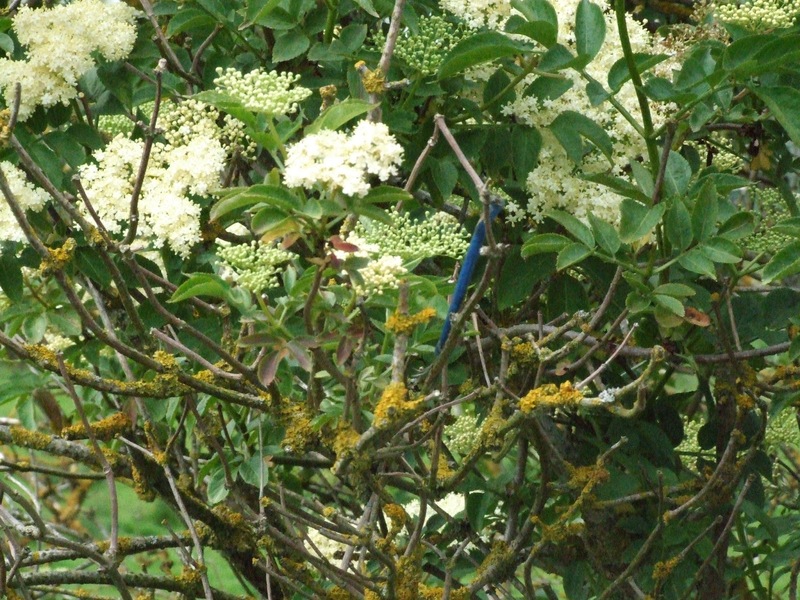 It was a false damsel fly in a verdant bush – and I loved it. The point of this installation is the close up – and it is very much captured in the very first photograph – but I have uploaded a picture of me making the installation as the ‘long shot’ to give a sense of scale and place. 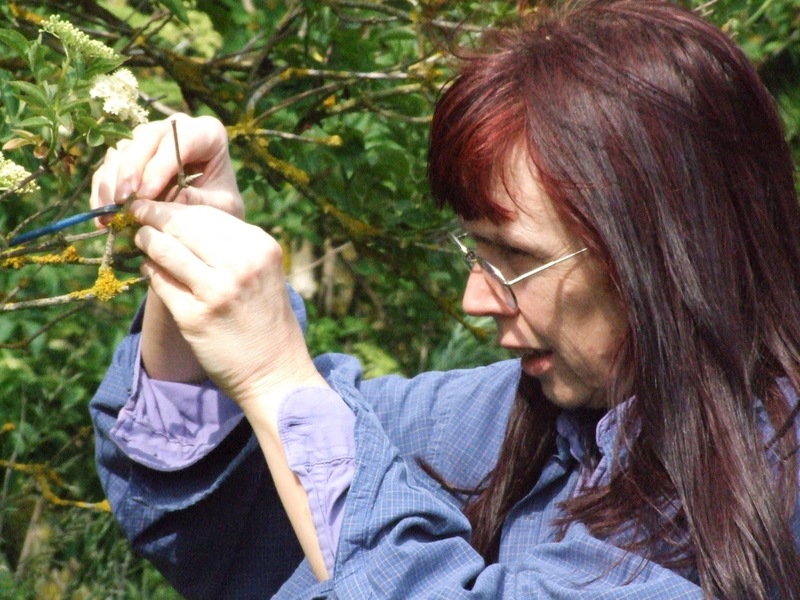 This installation was about looking really closely and intensely at a very small piece of the countryside – and seeing the wealth of detail, colour, intrigue and beauty in that small piece. Juxtaposing a false damsel fly was designed to catch and draw the eye – to draw attention to the place that held the 'damsel fly'. The colours were held in harmony – the shapes also complement and frame each other. This was a small but perfect installation. The message was that the very small can be as breathtaking and beautiful as the very large. I wanted to capture something intensely beautiful – but small – and that epitomised where I now live. I moved to the countryside from London, England. When in my twenties I could never ever imagine NOT LIVING IN LONDON. It was everything to me – pulsing with energy and life and happening… It was impossible to not live in London. As Samuel Johnson (I think) said: ‘He who tires of London tires of life.’ I absolutely believed that… Now – I see the life and beauty of the countryside – not just in the breadth and depth and height of it – but in the very small spaces as well. I have changed. This installation reflects that the wonder and beauty of everything can be in that very small thing – if we take the time to pause, to look and to see. I hope this is a beautiful Zen moment for the onlooker. This week was interesting on many levels: content, task, student reactions. The course covered portraiture from Egyptian statuary to the feminist photo-portraits of Cindy Sherman. We explored the differing relationships between the portrait and society; and between artist – model - society. Early portraits demonstrate power and status, caricatures became political commentary and documentary style photography was used in the early 19th century to educate the workers about the new technology of the industrial revolution. Dorothea Lange documented the Depression and the Second World War in America – with specific reference to the impact on the lives of ordinary people. This sort of documentary work was not just to record inequality in society – it was designed to change society. This week’s task was to take a black and white photograph of a chosen subject – and then to render that as a collage portrait using newspaper pieces. The intention was to get us to explore texture and tone in a very slow, intense and embodied way; and to use those to portray the essence of our subject to the audience. Here are some of my pictures – with a brief discussion of what I was trying to achieve – followed by potential lessons for practice. I developed a collage portrait of a youth in a leather jacket standing in a still wild space in urban London.... This was the 1980s and had exactly the feeling that I wanted to explore - human 'wildness' in an urban setting. 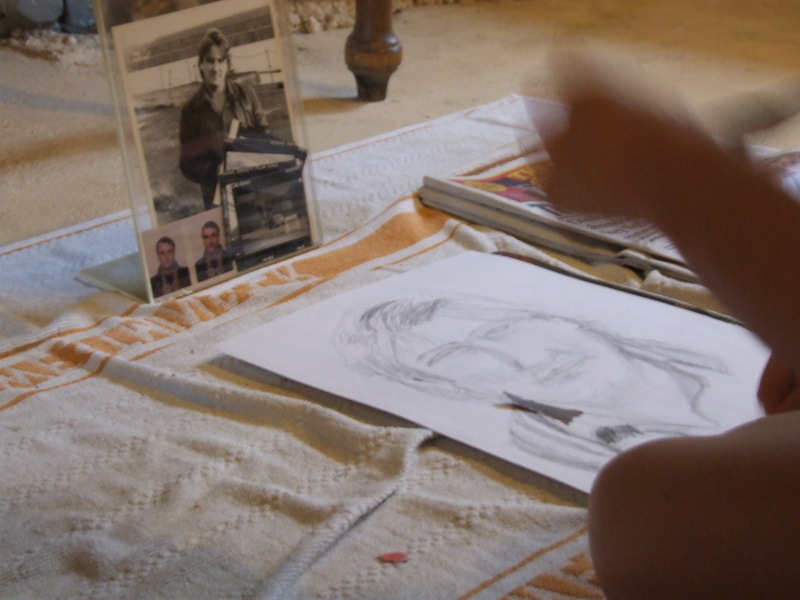 After sketching the face onto a larger sheet of paper – using a pencil to indicate tone – I started to build up the portrait. I sat down with the photo in front of me - and the sketch on the floor and a large pile of Observer newspapers. I started to tear off dark strips to capture the darkest parts of the picture - and also to set a shape to the face. 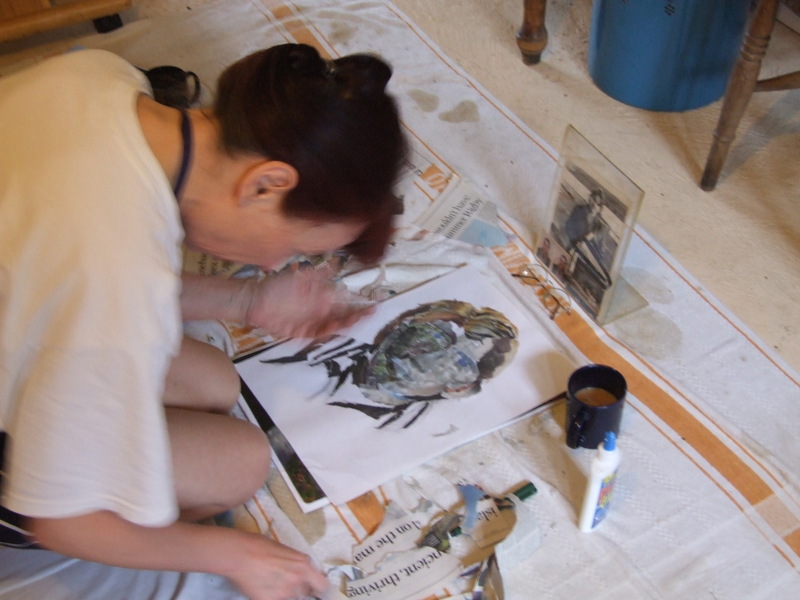 As I started to fill in the outline and formalise a shape, I started to use elements of more organic pictures - earth, rocks, trees, elephant skin, sky, clouds, fur - to detail the face and create the wild feeling that I was after. I don’t think that I obeyed the ‘rules’ of the task – but I am really pleased with the final portrait and the effect is achieves. No matter how interesting or meaningful or challenging the assignment - there will be dissent. When you have set a good task with excellent learning outcomes, stick with it – do not be ‘bullied’ by negative student voices… At the same time – the best students are not necessarily the most obedient ones. It can be the most engaged who are often the ones who push and pull at the boundaries – who challenge the rules and constraints. It is our art to know the difference. This week we studied ‘Mail Art’ or Correspondence with Memory – and connected with Fluxus Art of the sixties. There are elements of the personal and the surreal in this movement – from Van Gogh’s illustrated letters to his brother to Eleanor Antin and her series of 100-boot postcards capturing images of 100 boots as they journeyed from the Pacific to New York – and Ray Johnson’s provocative abstracts and collages – connected by cartoon-like bunny faces that then became a signature. Our task was to create a memory of our own and capture it upon an envelope – front, back, sides and inside. This was to be extended by the insert(s) that we made and placed within the envelope; designed to intrigue the audience. 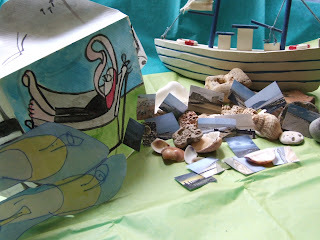 I chose to illustrate memories of Leysdown – a seaside town where we had a caravan by the sea. We used to go there from when I was about eight – and it was freedom. Small boat – in blue and white. I chose a square envelope shape so that it looked like an explosion of images and ideas when it burst open. I painted the front of the envelope to look like a postcard from the seaside. 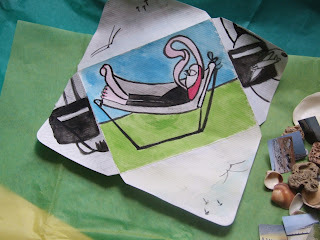 It is a Surreal representation (after Miro) of my niece sunbathing in black outside the caravan, by the sea. I chose Surreal to juxtapose the ordinary with the extraordinary – and thus illustrate the potentiality of the seaside. 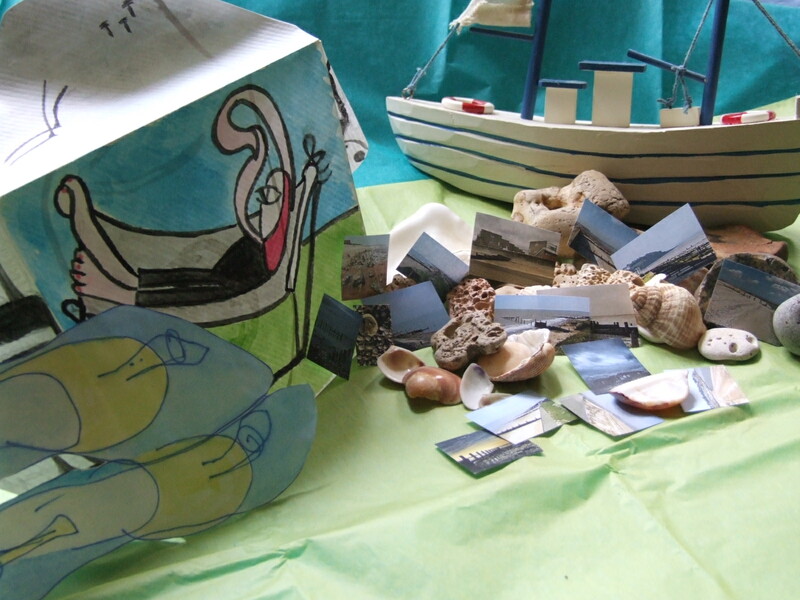 The external side flaps are drawn and painted with images of pill boxes – a common sight in and around Leysdown – from the war – but I’ve turned them into representations of the face of Ray Johnson’s rabbit – a nod to Mail art and its history and connecting it to Leysdown and its history. The top and bottom flaps show the flat sea and the sea forts (more memories of the War) in the distance – with seagulls. The images mirror each other: the top is more grey showing the more regular reality of the North Sea – cold and desolate – but the bottom image has more yellow and a lighter blue, it is slightly sunnier than the top. I’ve painted very sparsely, a few black lines of paint on white, on the inside of the envelope to create a simple, calm Buddha like face – representing my inner calm and peace when I go to Leysdown. 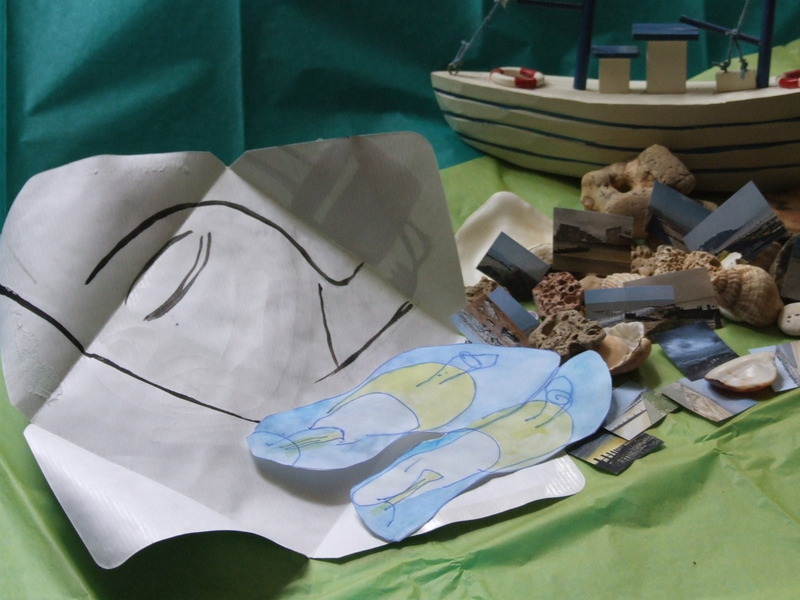 The insert is a cut out of a ‘blind drawing’ of a pair of the ‘swimming’ shoes that I use, there are sharp cockles (shell fish) in the silt-like mud under your feet – I always try to swim there and it is so much easier when your feet are not bleeding. 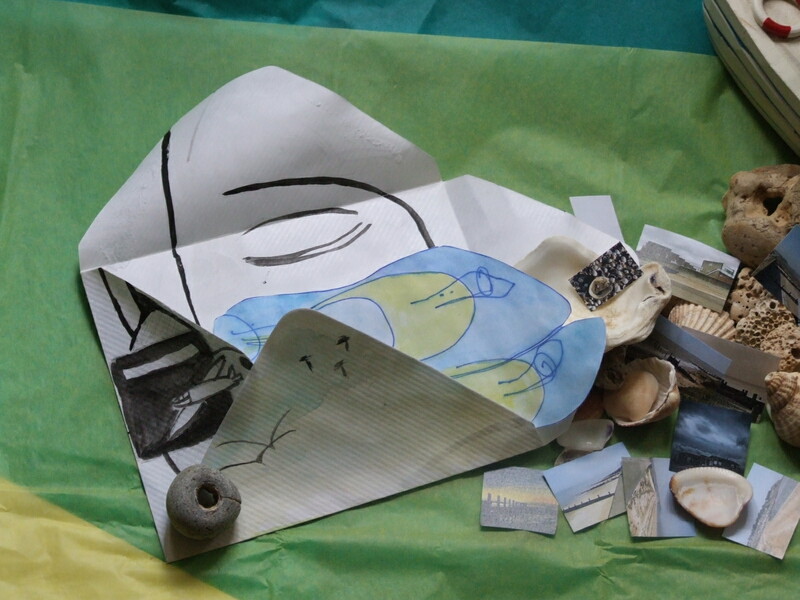 I also included many small pictures of the flat and desolate coast itself - and the shoes and the images are designed to fall out of the exploded envelope amongst small rocks and shells from Leysdown itself. I have placed this on layers of tissue paper – sheets of different blues and green mirroring the complexity of the seascape – and a layer of yellow for the shore. I added a small boat in blue and white to tie the whole together. Three people reviewed my collage and none of them actually liked it. Nearly all of them gave me friendly and encouraging comments – but my grade was just a little over the average. Now I am not young and I’ve been knocking about Education for some very long while so I did not take to my bed and weep, but … Feedback can be dispiriting no matter *how* helpful. I wanted to discuss those comments with my assessors – and put my case – and change their minds… and yes I felt a lot less enthusiastic about this week’s task than I did before. What can we do about this? We do mark and grade and we do give feedback and feed forward and we hope that it helps. Perhaps we need to actively develop resilience (not Gove’s form of resilience!) in our students so that they do not bend and break under our feedback? Perhaps we need to make more time to give feedback in person and in conversation – and wouldn’t it be great if that time was valued by our institutions. MOOCs set a lot of work each week (and still we usually do *more*) – and peer review is considered to be part of the learning and part of the assessment process. I do know of postgraduate courses that set peer review, but everyone tells me that undergraduate students won’t do it. However, I hope that if we start in the first year and from the first week to set rigorous weekly tasks that are peer-reviewed as the norm, no one will even think to object. #7: Don’t wait to be inspired – just do it! As said, my feedback dispirited me somewhat, and I started to feel under-whelmed by this week’s task. However, I have studied often before – and I wanted to get the assignment done… so I just did it anyway. I always advise students not to wait for inspiration: have a set time and place to work – and just do it. Just start; just brainstorm; free write; put BLAH BLAH BLAH and move on … but get something down and you are on your way. I did exactly that for this task – and it is done. Of course when working with ‘non-traditional’ students, we may need to help them build this work habit rather than just expect it to emerge. Hence the suggestion above that in at least one first year module we do set weekly, rigorous and hard tasks for them to do – and to peer assess as part of their learning process. If we help to build positive habits they too will be sustained when tired or uninspired or lovelorn or any of the things that get in the way of work. 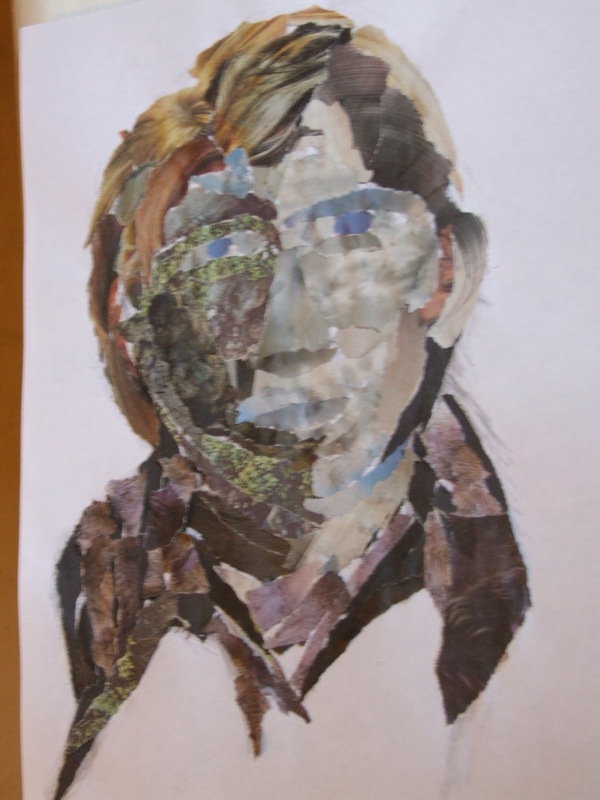 NEXT WEEK – portrait with collage – ooo errrr. This week we explored Fantastic Art – Bosch, Rousseau, Chagall, Chirico, Man Ray, Duchamp, Arp, Ernst, Miro and Dali. After reading about them and observing videos upon them (this is more of an xMOOC (content-driven) than a cMOOC (connectivist)), we had to choose a topic and an influence and produce an art work of our own. We had to justify our process and our product – and the intended impact upon our audience. 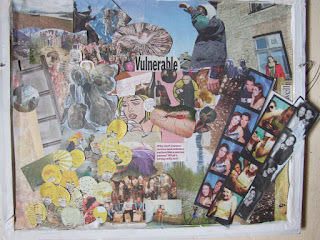 I chose to produce a collage – channelling the unconscious to see what would appear. Here's my picture-making - and then some thoughts on how we might use this in teaching. My approach was to weave the Surreal and the DaDa together – to explore a deep emotion through chance and a lack of control – to create a picture with rhythm perhaps – but not in a controlled way. I drew on the Surreal because I wanted to channel the unconscious – I wanted to see what would emerge when I explored a deep emotion, when I let my unconscious out. I chimed with DaDa because of the destructiveness and chaos of their art; their reaction to the World War. There could be no beauty in a time of such horror – no controlled and controlling art to soothe the senses - for this would be a lie. Their anti-art was designed to confound and challenge the immensity of total war. I wanted to explore the immensity of betrayal; when it happens this is a personal atrocity. I was heavily influenced by Miro and the automatic – the sense of bringing forth deep emotion to see how it would look when it revealed itself. I wanted to harness something like Arp’s approach to collage – that if you do not control the process too much, the picture will reveal itself. Like Duchamp, I wanted to ‘find’ the picture in the newspapers that I chose randomly – and the random words and pictures that I cut out. And like the Hannah Hoch example we saw, I was using dull newspaper and newsprint, not the shiny glamorous material that is the magazine picture. This was partly because the newspaper was to hand – and mostly to reject the shiny shiny happy of magazine paper. Even as I copy and paste these instructions here, I think you can see how applicable they can be to an academic context. How different these words are to the implicit instructions behind so many of our assignments: shut up, I’m not interested in what you have to say or in what you think and feel. I want to know whether you have understood the importance of what I have told you – and whether you can cough it back up to me in a way that shows me you are a good and proper student. 1. Explain your art or teaching/learning process. How was the resource made? Which activities, materials and approaches did you use and why? 2. Describe the idea behind your resource. What story or message does it get across? What does it mean to you? Here the student is both in the task and over the task – their voice is heard – not in empty reflective gestures – but in a way that invites them to powerfully engage. In a recent Jiscmail exchange (www.jiscmail.ac.uk/ldhen) I was talking about an early exercise I used to do with students to introduce them to academia – its processes, practices and genres. Each week we would read and analyse poetry and prose – interesting and engaging poetry and prose (!) – and then I would ask them to write about something that they wanted to write about – using the genre or style that we had just explored. At the end of the course, I collected and published their work. We modelled good academic practice as we discussed, criticised and argued our case - and each time they wrote they mastered a new genre – as later they would have to master the essay, report and presentation. But most importantly, they were interested and engaged – and when they wrote, I respected that they would have something of value to say. 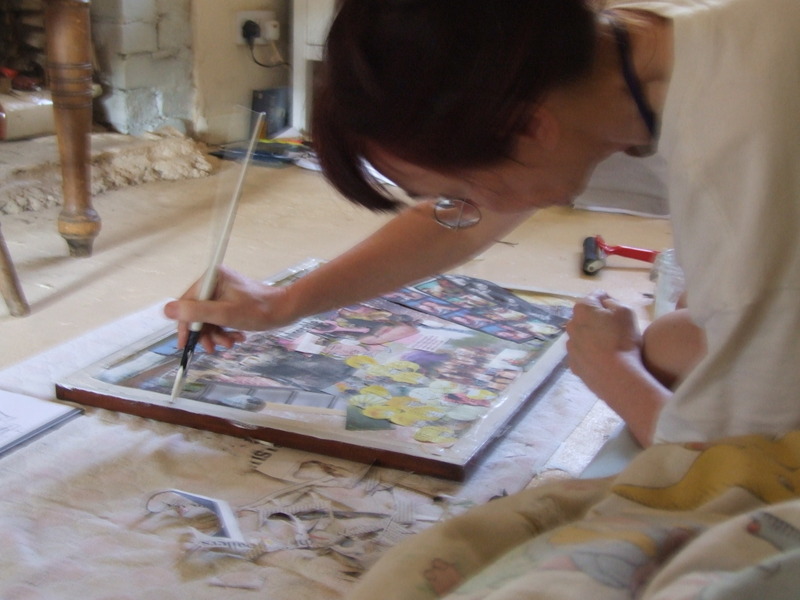 I found the production of my own collage intensely absorbing – it was hard work – but oh was I engaged with it. When I wrote the reflection I managed to tease out many more ideas – and to craft an argument together about what I had done and why. More reflection on the piece that I had produced, generated further insights… and this really was writing to learn. 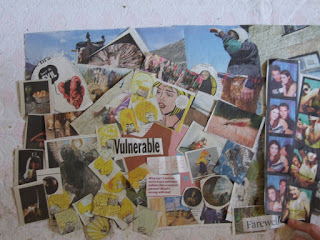 I am looking forward to bringing collage into my practice. 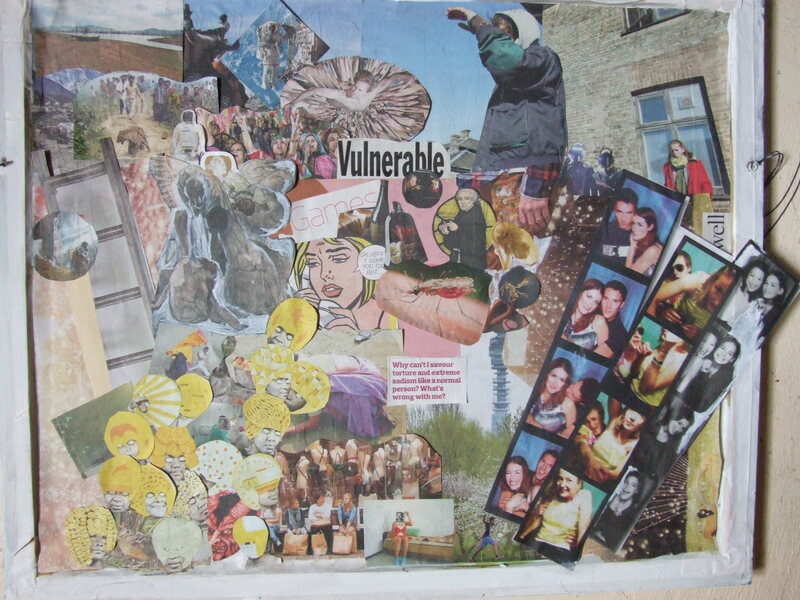 A colleague and friend, Pauline Ridley, recommends the use of collage to get students more engaged with potential dissertations and projects – see her website for many ways to get the visual into teaching and learning: http://www.brighton.ac.uk/visuallearning/. With project planning, she suggests that we get resources and students together – and invite them to channel their feelings about a course as they create their collages. 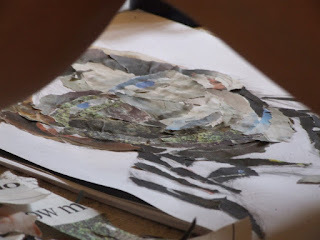 Once they have produced the collage – they can step back and analyse it – and choose an engaging topic to explore – instead of researching something because it vaguely seems like a good idea. 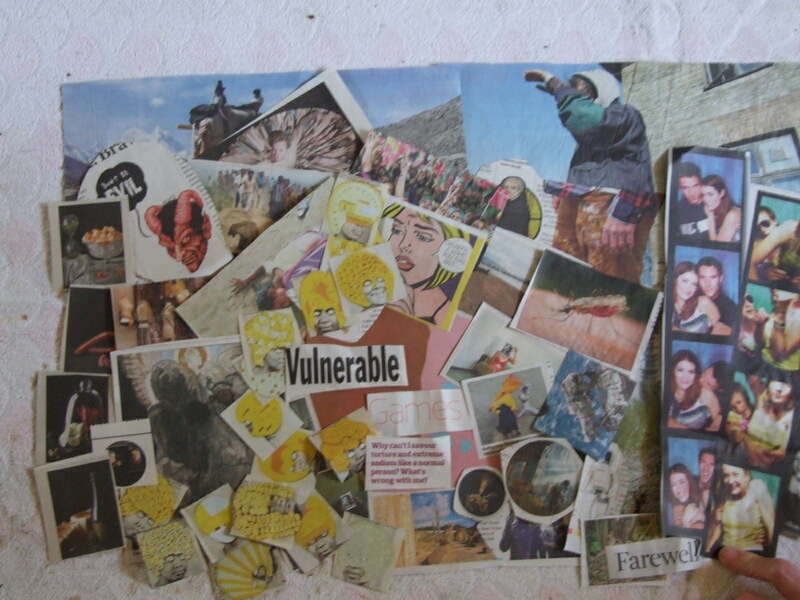 I also want to use collage to give students more power and control over their learning. My plan is to insert a collage day about week six of a long course. At the beginning of the course I will herald this as a day of fun and excitement – and ask students to prepare for it by cutting words and pictures out of newspapers and magazines. On the day itself, I might divide the class in two – one half to use the words and pictures to reflect back on the learning that has already occurred – to summarise this highlighting the ideas, theories and concepts of most interest and significance to them. The other half could be invited to refer to their Handbooks and speculate on the learning to come – or to think about the learning that had occurred and how it can be used in the assignment. I am exploring here – so this will evolve before the session itself... Meanwhile some resources and tips for those who want to try this for themselves. My approach was to weave the Surreal and the Da Da together – to explore an idea through chance and a lack of control – to create a picture with rhythm perhaps – but not in a controlled way. I would suggest that you introduce notions of the Surreal – allow students to see what emerges when conscious control is let go. Show some images from Chagall, Arps, Duchamp and Miro to loosen them up. Students may not be aware of all they are engaging with and learning and the complexity of the whole University experience; Surreal collage allows some of this out for further consideration. Possibly introduce elements of DaDa. Dadaism was a reaction to the destructiveness of World War. There could be no beauty in a time of such horror – no controlled and controlling art to soothe the senses Their anti-art was designed to confound and challenge the immensity of total war. Students may be reacting against academia and its control – and may need to explore that. On the way to making my collage I became fascinated by the words that I cut out from the newspaper and put them in a clear plastic folder to see what you could read from them when they moved about kaleidoscopically within the bag. You could get your students to do the same to see how this sparks thoughts about the course and their learning to harness when producing their collages. When the first rush was over – I saw that I needed some framing pieces. I got my large pictures and squeezed some under the top of the picture; some I cut up and used to frame the bottom. I sketched this rough draft to get a sense of the overall shape and placing of pictures – but I was not going to stick to it rigidly – if different placings emerged as I made the next draft – then that would be okay. 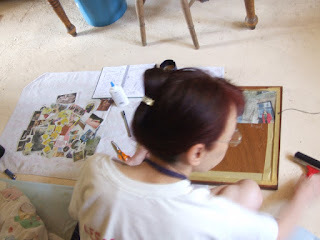 I then started trimming the newspaper pictures and placing them on plywood (I did not have paper or card large enough) …spreading the glue and placing the pictures – sometimes rolling them flat – sometimes padding them flat. Encourage this process in your students – allow it to be fun. Encourage them to be absorbed and work in silence if that suits them - or encourage them to explain what they were doing, the pictures they had chosen and why… as they are gluing the final pieces down. 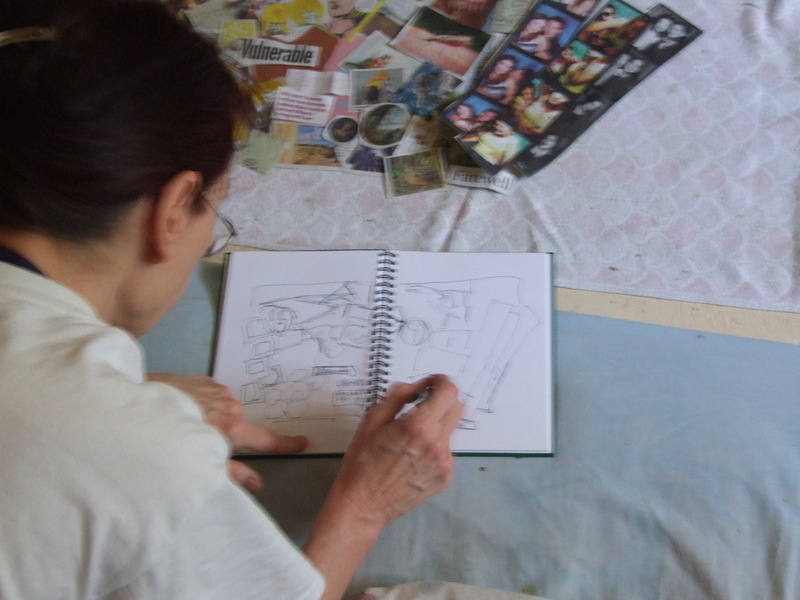 Describe the idea behind your artwork. What story or message does it get across? What does it mean to you? Why did you create it? What are your reasons for creating that specific art piece? What do you want your audience to feel and think while observing it? What might have happened as they produced their works, is that conversations about the course were taking place. The collaborative process here provides an hermeneutic or reflective space in which learning can happen – within themselves and between each other. At the end of the session not only have you modelled interactive and connectivist and collaborative learning – and good notemaking – and positive reflection … you should have some wonderful pictures to put up – or to photograph and place in your VLE – and your students should have a new energy and enthusiasm about each other – and about the course itself.